This bespoke ring is perfect for everyday wear or as an eternity ring. 9 carat white gold, 9 carat rose gold and 9 carat yellow gold have been chosen to give the impression that the ring is three separate rings, further accentuated by the engraved lines, separating each metal. The ring holds ten brilliant cut H Si diamonds (totalling 0.10ct) ranging from 1mm-1.5mm in size which have been invisibly set and randomly scattered across the design. 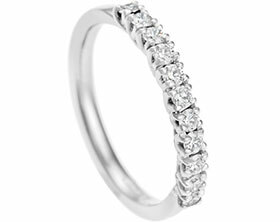 The ring has been given a polished finish which further highlights the brilliance of the scattered diamonds.